Just 15 minutes from downtown New Orleans, Express Inn of Westwego is conveniently located near a wide array of attractions and entertainment. Whether you're looking to immerse yourself in the historic roots of southern Louisiana or enjoy a night out in New Orleans, our guests will enjoy cozy, affordable accommodations and a host of amenities, including color cable television with HBO™ and Cinemax™, microwave and refrigerator and FREE high-speed Internet! Browse through our comprehensive local guide to find things to do in our neighborhood and also be sure to sign up for our email offers. 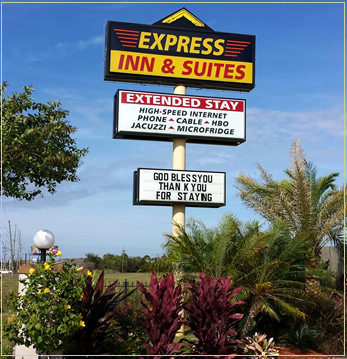 We invite you to come stay at Express Inn of Westwego. Pleasecall 504.301.1969 for reservations.